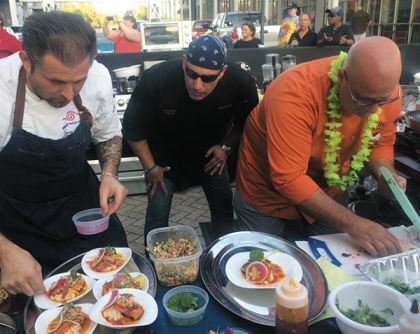 Competitors converge from far and wide to participate in this premier cooking competition, including these chefs from Hawaii. Watch chefs create culinary magic at this premier culinary competition . . . or be part of the action as a competitor or judge. 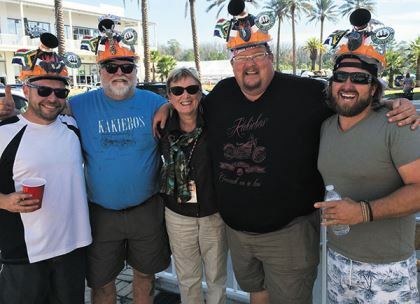 When we were invited to be judges at the World Food Championships, held at The Wharf in Orange Beach, Alabama, we loaded the RV and headed south. Who wouldn’t want to be part of the ultimate food sport in the world’s largest kitchen arena under a big tent in the Alabama sunshine? We didn’t have to wait long to cross paths with some of the competitors. En route, in an RV park in Kentucky, we met Team Roberstons Braai-B-Que from South Africa. They introduced us to their mascot, a little brown piglet named Barbie. The World Food Championships (WFC) are the culinary Olympics. Each November, people from many countries and all walks of life compete and unite in their passion for food. WFC is an opportunity for home cooks and professional chefs to go up against each other for a chance at big money. And no, the professional chefs don’t always win. 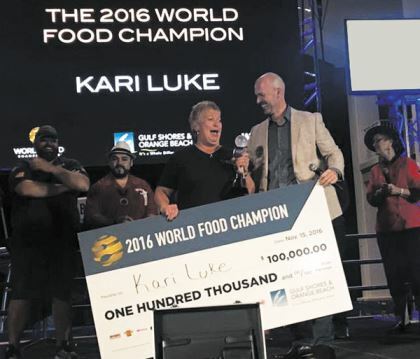 In 2016, Kari Luke, from Cissna Park, Illinois, went home with the grand prize of $100,000. Her unpretentious, grilled ribeye steak, garnished with two button mushrooms, two bacon-wrapped Gulf shrimp, and a drizzle of red wine reduction, wowed the judges. Her husband, Bryan, was her assistant. “We’re just plain and simple backyard cooks,” Kari said. “I do the reduction; my husband does the cooking. The steak is the star.” We discovered later that their motorhome was parked two sites down from ours at Pandion Ridge Luxury RV Resort, less than a mile from the WFC venue at The Wharf. When Liz Harper Kraatz, a professional baker, realized she couldn’t get into the dessert category because it was full, she switched categories and won with her turkey tail chili. She went on to win in the chili category a second year in a row. The WFC roster in November 2017 included more than 1,500 chefs and cooks from 42 U.S. states and 13 countries. The 2018 competition is projected to be even bigger. From November 7 to 11, culinary teams will compete in 10 categories: barbecue, bacon, burger, chef, chicken, chili, dessert, sandwich, seafood, and steak. There are three ways to experience the World Food Championships. You can be a judge, a competitor, or a spectator. All three positions transport you, one way or another, right into the heat of the kitchens. Our first responsibility, after arriving in Orange Beach, was to obtain certification under the EAT Methodology for judging. With our Gold Card EAT certification, we are now qualified to judge at any WFC event in the future. All food categories are judged on the same “EAT” criteria: Execution (35 percent of final score), Appearance (15 percent of final score), and Taste (50 percent of final score). As judges, we set aside our own personal food preferences, because the stakes are high for the competitors who have put in hours of preparation and practice, long before they arrive in Alabama to compete. To ensure double-blind judging, competitors deliver their entries to the turn-in table on numbered trays. Once at the turn-in table, their trays are renumbered before being presented to the judges, who are segregated from the action. On their turn-in trays, each competitor provides a primary dish to be judged for appearance, as well as small sample dishes for each individual judge to rate on execution and taste. The colors, textures, and aromas of spicy sauces, grilled meat, candied bacon, seared seafood, and sweet icings transport judges to foodie heaven. We still talk about the “best slice of cake” that earned a perfect 10-10-10 score from every judge at our table. Before you can register to compete in the World Food Championships, you need to qualify. Numerous qualifying opportunities appear under the “Compete” section on the WFC website: www.worldfoodchampionships.com. Once you have qualified, perfected your dish, and confirmed your registration, it is up to you to book transportation and accommodations; pack up your equipment, display dishes, and teammates, if you require them; and get yourself to Orange Beach, Alabama. During the competition, timing is crucial. A late turn-in to the judges is a reason to be disqualified. “Cheferees” watch to make sure everyone abides by the rules. Be even a fraction of a second late, and the chance of winning slips away. WFC becomes a sitting-on-the-edge-of-your-seat experience when spectators and fellow competitors help any stragglers by shouting out the final 10 seconds of the hand-in countdown. With free general admission, spectators can watch the kitchen arena action from just a few feet away. You get to hear the chopping, see the flames on the grills, smell the sizzling bacon, and listen to teammates encouraging each other. You can wander the grounds, meet cooking teams from around the world, take in cooking demonstrations, enjoy family-oriented food games, and watch live entertainment. There are fun food challenges, such as Kids Kookoff, Military Chef Challenge, Granny Grilling, and Thrilla At The Grilla. Last year, a $50 ticket provided access to the VIP Lounge for a direct view of the turn-in action, with complimentary refreshments and tastes of the award-winning dishes. Other special events requiring tickets, sometimes with the proceeds going to various charities, also take place. In 2017 these included the “Bourb’N’Que” dinner; a progressive dinner party on five yachts; and the Tasting Village. In the latter, samples from local, regional, and national producers were available for $5. If you have a passion for food and want to experience the World Series of food sport, we recommend you add the World Food Championships to your bucket list in November 2018. Whether you attend as a competitor, a judge, or a spectator, you will find yourself surrounded by foodie opportunities. As the setting for the World Food Championships, Gulf Shores and Orange Beach, Alabama, are located on the Gulf of Mexico, featuring 32 miles of white, sandy beaches. RV parks and the Gulf State Park Campground are in prime locations; fishing, backcountry trails, and golf courses are located nearby. The latest food trends flourish at beach-style and award-winning-chef-caliber restaurants in both cities. Phyllis and Lamont’s 10th cookbook, On the Road with The Cooking Ladies, Let’s Get Grilling, is available on Amazon.com and wherever books are sold. Visit www.thecookingladies.com for more information about these traveling chefs.